I find myself enjoying 100 Cupboards , at least in part, for the same reason I liked Leepike Ridge : Wilson's use of imagery and the English language. Henry, Kansas is a hot town. And a cold town. It is a town so still there are times when you can hear a fly trying to get through the window of the locked-up antique store on Main Street. Henry* slept for a long time. Heh woke because he couldn't sleep any longer. His body was full. The grown-ups were all inside the yard, standing around grills or setting out casseroles, paper plates,a nd flimsy plastic utensils designed to snap when used. 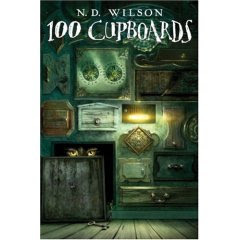 100 Cupboards is a more suspenseful read. It's full of mystery and intrigue. There are hidden cupboards that strange and scary creatures come out of to haunt the world in which we live. Far away lands, compass combinations, and baseball games in a quiet and lazy town. We went on vacation last week and I wanted to take something fun and relaxing with me to read. This was my book of choice, having just snagged it at a local bookstore, and I'm glad of it. I do admit to being confused a bit by Wilson's description of how and why certain of the 100 cupboards took you places and others led you back to where you started. (Am I sounding vague and confused? Yeah, I am a little.) I'm not sure if I was reading too fast and thus didn't give myself the opportunity to comprehend. My husband read the book on our plane ride back and he confirmed certain aspects of the story were more confusing. However, generally speaking, this book is adventurous fun. Jonathan (my husband) said that certain aspects of this book had a Narnia feel to them. He also said that it reads as if someone is telling the story aloud and on that part I concur. I had the impression while reading that this book would make an excellent read aloud book - almost more so than as a private, individual read. I don't think I've ever said that about a book before but in this particular case, I think it is true. Wilson does tell stories in a manner that demands a visible audience. It's hard to describe that but I feel it. If you've read this book and loved it, you'll be happy to know that the sequel, Dandelion Fire: Book 2 of the 100 Cupboards is due to be released very shortly. If you haven't read the first book, you can rest assured that a new adventure series worthy of time and consideration is being released for your enjoyment. I still like N.D. Wilson stories. Very much. So I'll be after a copy of Book 2 for myself (and for my family who will be reading this aloud together someday, no doubt)! I, too, adored Leepike Ridge. The general flavor of Nate's fantasy is the flavor of my fantasy novel. It's nice to be able to mention Cupboards when saying, my book is similar to... There aren't many recent books in that family read-aloud genre. I actually thought the title of this post was '100 Cupcakes' when I clicked on it and I was quite excited. Still sounds good.. I haven't read Leepike Ridge but I just loved 100 Cupboards. I just got an ARC of Dandelion Fire this week and can't wait to read it! This sounds really interesting. I bookmarked Leeplike ridge and 100 cupboards. Will prob read Leeplike first. I love these types of books. Thanks for the review.